This week and last week we have made some great progress at organizing the wood workshop. The new dust collector system has been installed, which allowed us to get rid of the big old noisy vacuum, and unmarked member projects have been moved to the attic, where they are less in the way. It seems to be time to remind everyone again that the workshop is not a place for storing personal projects, and any projects left lying around can be moved to the attic during cleaning. If a project is not marked with a member’s name or nickname and a date, it is considered abandoned and can be freely re-purposed for materials by anyone when needed. 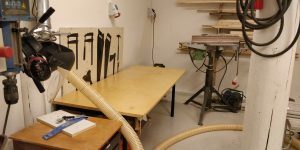 After some organizing, we found that we now have enough space for another big table in the workshop. There happened to be a suitable one in the attic, so we now have much more space to work. The scrap wood boxes (now located under the new table) are overflowing, so anyone with wood-heating at home is welcome to pick up some for firewood. In case anyone has an extra (sturdy) table, 120 cm or more in width, we would need one for the lathe. It is currently lying on the floor and thus unusable.